In Greek mythology, the Gorgons were three vicious female mythical creatures that lived on an island and possessed the ability to turn a person to stone by looking at them. They possessed both beautiful and hideous traits, the most famous being their head of coiled snakes instead of hair. Of the three, Medusa is perhaps the most famous of the Gorgons, being the only one of the three who was mortal. Also, many references are made to her specifically in literature and movies. She, like many such creatures, met her doom at the hands of a hero aided by the gods. While the tales of Gorgons were and still are considered fictitious, they continue to have meaning for us today. Their beauty attracted all people to look at them, despite the presence of the snakes in their hair which could readily be seen as an indication of their evil nature. A mere glance by a person at a Gorgon was sufficient to kill a person. In metaphorical resonance, human beings readily succumb to temptation when they act out of selfish desire for immediate gratification while disregarding the guidance and warnings of the conscience, and through such actions they may well "die" in some way. 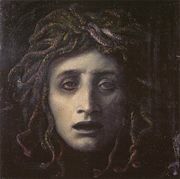 The most beautiful Gorgon, Medusa, was also mortal, and so could be killed by the one who did not look directly at her. The lesson here could be that victory can be gained by avoiding even the sight of evil. The word Gorgon comes from the Greek word γογύς which roughly translates as "terrible." The Latin form, Gorgonem, is the origin of the English word. From Latin also comes the words Gorgoneion, which means the representation, usually an artwork, of a Gorgon's head; Gogonia, someone that has been petrified by a Gorgon; Gorgonize, the act of petrifying someone; and Gorgonian, which is a resemblance to a Gorgon. The name of the most famous Gorgon, Medusa, comes directly from the Greek Μέδουσα. Gorgons. Attic black-figure lekythos, ca. 530 B.C.E. Generally, the Gorgons are identified as female, with scaly golden bodies, a human if not hideous face, hair of coiled, live snakes, and the tusks of boars. They also are said to possess wings of gold, but it is not said if they can fly. Beyond their ability to turn anyone into stone by simply looking at them, the snakes on their head were believed to be poisonous and they sometimes were depicted as having sharp claws that could easily rip and tear flesh. As with many Greek myths, the legend of the Gorgons cannot readily be traced to an original source. While the roots of many mythological creatures seem to lie in an attempt to understand nature and the world, the Gorgons seem to represent ugliness and fear. The Gorgons' ability to kill their opponents with a look renders nearly all human abilities useless, thus making even the most skilled warriors impotent. In many cultures, snakes are regarded with fear, so it is justifiable that such a dark creature would have them covering her head. Furthering this idea is the body of scales, suggesting a more reptilian connection, but there is just enough humanity mirrored in the face to make the Gorgon recognizable to humans. Thus the Gorgons may represent the ugliest and most demented aspects of humankind. Stephen Wilk has argued that the myth actually resulted from astronomical phenomena: the variable brightness given off by a star in the Perseus constellation seems to mimic the mythical battle between Medusa and Perseus, in which the hero decapitated the Gorgon. To support his thesis that the myth derived from the constellation (as opposed to the generally accepted reverse scenario) Wilk also noted that a similar myth was common in many different cultures. As with many other Greek legends, successive generations and authors re-told the stories, and with each re-telling changed the story somewhat. It was Hesiod (Theogony, Shield of Heracles) who increased the number of Gorgons to three—Stheno (the mighty), Euryale (the far-springer), and Medusa (the queen), and claimed they were the daughters of the sea-god Phorcys and of Keto. Medusa was believed to be the only mortal of the three, and coincidentally she was also the only one to become pregnant. Tête de Méduse, by Peter Paul Rubens. 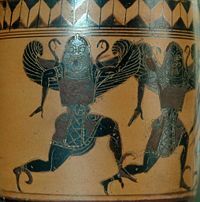 The Attic tradition, reproduced in Euripides (Ion), regarded the Gorgons as monsters, produced by Gaia to aid her sons, the giants, against the gods, and slain by Athena. 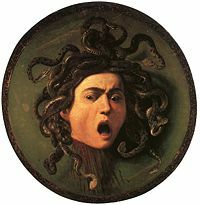 According to Ovid (Metamorphoses), Medusa alone had serpents in her hair, and this was due to Athena (Roman Minerva) cursing her. Medusa had copulated with Poseidon (Roman Neptune), who was aroused by the golden color of Medusa's hair, in a temple of Athena. Athena therefore changed the enticing golden locks into serpents. Medusa, by Arnold Böcklin (1878). The most famous legend involving the Gorgons was the story of how Perseus killed Medusa. According to the story, Polydectes secretly planned to kill Perseus and conceived a plan to trick him into obtaining the head of Medusa as a wedding gift, knowing that Perseus would more than likely die trying to complete the task. However, Perseus was aided in his endeavors by the gods Hermes and Athena, who not only guided him to the Gorgons' island, but also equipped him with the tools necessary to slay Medusa. Hermes provided him with a sword strong enough to pierce Medusa's tough scales and Athena presented Perseus with a finely polished, bronze shield, in which he could look at her reflection in the shield as he guided his sword, that way avoiding her deadly stare. While the Gorgons slept, Perseus crept into their lair and decapitated Medusa. From the blood that spurted from her neck sprang Chrysaor and Pegasus (other sources say that each drop of blood became a snake), her two sons by Poseidon..
Perseus and Medusa by Cellini, Loggia dei Lanzi, Firenze. Instead of presenting the head to Polydectes, Perseus decided to use to his own advantage. He flew to his mother's island where she was about to be forced into marriage with the king, warned his mother to shield her eyes as he withdrew the severed head from the bag in which he had placed it. Everyone present except Perseus and his mother was turned into stone by the gaze of Medusa's head. Knowing that whoever possessed the head had a weapon of cataclysmic potential, Perseus decided to give the Gorgon's head to Athena, who placed it on her shield, the Aegis. There are other, lesser told stories involving Medusa. Some say the goddess gave Medusa's magical blood to the physician Asclepius—some of which was a deadly poison and the other had the power to raise the dead—but that the power was too much for one man to possess and ultimately brought about his demise. Heracles is said to have obtained a lock of Medusa’s hair (which possessed the same powers as the head) from Athena and given it to Sterope, the daughter of Cepheus, as a protection for the town of Tegea against attack. Archaic fanged goggle-eyed gorgoneion flanked by sphinxes on a hydria from Vulci, 540-530 B.C.E. Since ancient times, Medusa and the Gorgons have often been depicted in artworks. 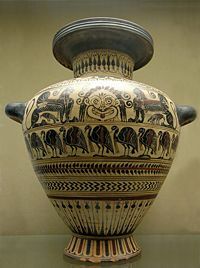 In Ancient Greece a Gorgoneion (or stone head, engraving or drawing of a Gorgon face, often with snakes protruding wildly and tongue sticking out between the fangs) was frequently used as an Apotropaic symbol and placed on doors, walls, coins, shields, breastplates, and tombstones in the hopes of warding off evil. In this regard Gorgoneia are similar to the sometimes grotesque faces on Chinese soldiers’ shields, also used generally as an amulet, a protection against the evil eye. In some cruder representations, the blood flowing under the head can be mistaken for a beard. On shields, pots, and even in large carvings and statues, the epic defeat of Medusa by Perseus has been depicted, usually in celebration of Perseus' triumph over the Gorgons. Medusa is a well-known mythological icon throughout the world, having been portrayed in works of art as well as popular media over the ages. 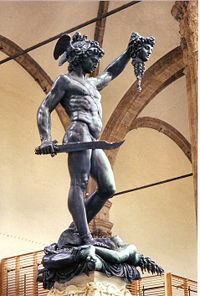 Leonardo da Vinci, Benvenuto Cellini, Antonio Canova, Salvador Dalí, and Arnold Böcklin are a few of the more famous painters who have depicted Medusa, often in battle with Perseus, over the years. Like cyclops, harpies, and other beasts of Greek mythology, Gorgons have been popularized in modern times by the fantasy genre such as in books, comics, role-playing games, and video games. Although not as well known as dragons or unicorns, most popular lore concerning Gorgons derives from Medusa and the Perseus legend. Images of Gorgons and Medusa are commonly mistaken to be the same. According to most of the original Greek myths, Medusa was the only one of the Gorgon sisters to be beautiful; the others being hideous beasts. Over time, however, and possibly even in their original day, Medusa too came to be seen as an evil monster. ↑ Stephen Wilk. Medusa: Solving the Mystery of the Gorgon (Oxford University Press, 2000). ↑ Edith Hamilton. Mythology (1942). ↑ Frederick Thomas Elworthy. "Chapter V: The Gorgoneion" (1895). Retrieved August 11, 2007. Elworthy, Frederick Thomas. The Evil Eye: An Account of this Ancient and Widespread Superstition London: J. Murray, 1895. Retrieved August 11, 2007. Harrison, Jane Ellen. Prolegomena to the Study of Greek Religion. 1922. All links retrieved June 26, 2017. Medusa Coins Ancient coins depicting Medusa. On the Medusa of Leonardo Da Vinci in the Florentine Gallery, by Percy Bysshe Shelley. Theoi Project, Medousa & the Gorgones References to Medusa and her sisters in classical literature and art. This page was last modified on 26 June 2017, at 14:21.